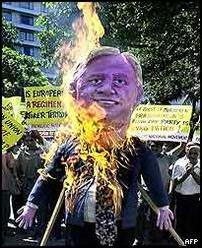 Sinhala nationalist protestors burnt an effigy of European’s Union Commissioner for External Affairs, Mr. Chris Patten in the busy business hub of downtown Colombo Tuesday moring. Mr. Patten arrived in Sri Lanka’s capital Tuesday for meetings with Prime Minister Ranil Wickremesinghe, President Kumaratunga and the leader of the Liberation Tigers, Mr. Veluppillai Pirapaharan. 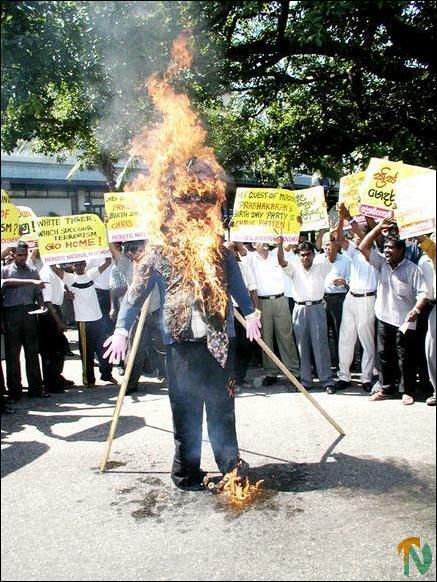 The protest was organized from 11 a.m. by the Patriotic National Movement formed by the Sinhala nationalist Janata Vimukthi Peramuna and President Kumaratunga’s People’s Alliance. 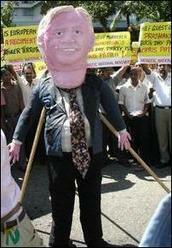 The protesters shouted slogans against Mr. Patten and warned the Sri Lankan government against the “sinister designs of European Imperialism to divide the island”. The EU External Affairs Commissioner’s scheduled meeting with Mr. Pirapaharan on Wednesday has drawn howls of protests from Sinhala nationalists and extremists. Sections of the Sinhala and English language media have been calling on the government to ban Mr. Patten from Sri Lanka. The Sinhala nationalist English daily, ‘The Island’, depicted Mr. Patten with a Tiger tail in an op-ed cartoon in its Tuesday edition.